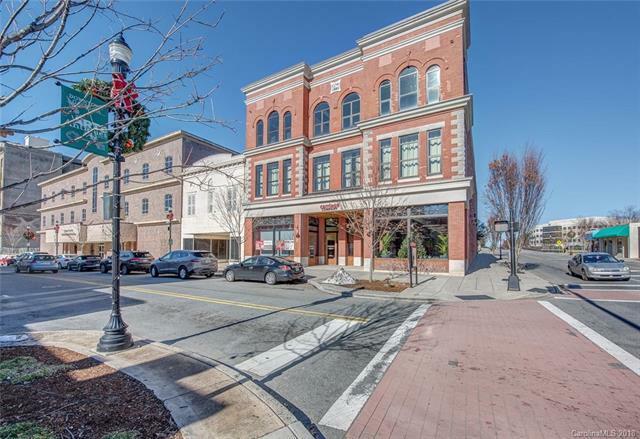 Downtown living in the heart of Gastonia! Enjoy the beauty of this fabulous historic building with modern updates and conveniences with awesome views overlooking the city. The solid brick construction insulates so well providing a good noise barrier and keeps utility costs to a minimum. Walk to shops, great restaurants, night life and more. This loft style condo has elevator access, fitness room, parking lot in rear, plus assigned space. Water is included in monthly HOA fee. Deed restrictions include income limits - contact agent for information. Offered by Allen Tate Gastonia. Copyright 2019 Carolina Multiple Listing Services. All rights reserved. The data relating to real estate on this Web site derive in part from the Carolina Multiple Listing Services, Inc. IDX program. Brokers make an effort to deliver accurate information, but buyers should independently verify any information on which they will rely in a transaction. All properties are subject to prior sale, change or withdrawal. Neither Scarlett Real Estate, LLC nor any listing broker shall be responsible for any typographical errors, misinformation, or misprints, and they shall be held totally harmless from any damages arising from reliance upon this data. This data is provided exclusively for consumers' personal, non-commercial use and may not be used for any purpose other than to identify prospective properties they may be interested in purchasing. © 2019 Carolina Multiple Listing Services, Inc. Data last updated 2019-04-21T23:58:30.27.